These bluebirds were so striking with their chestnut and blue feathers contrasting with the snow, I couldn't help but take a bunch of pics. 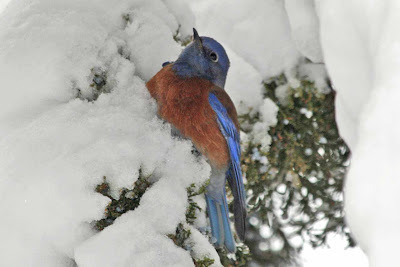 There is nothing like a snowstorm to bring out the bluebirds, they seem to materialize from nowhere when the flakes fall. We had our first real snowstorm in Canon City this season, with 5-6 inches of wet snow falling overnight and into yesterday morning. 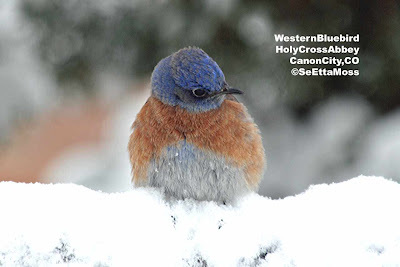 These were a few of the two dozen Western Bluebirds I watched as they picked berries from some tall juniper trees. 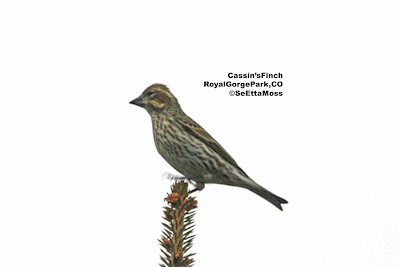 Cassin's Finch usually breed in conifer forests in Colorado at high elevation then do migrate to lower elevation foothills and nearby plains in fall and winter. 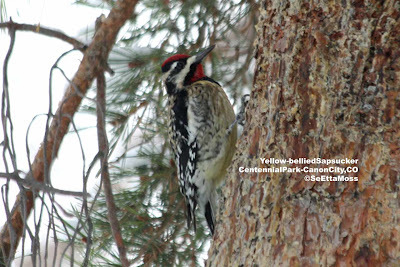 I usually see at least a few at my feeders in Canon City, but I haven't had much interest even by more common feeder birds since I filled my feeders several weeks ago (I don't feed in summer or early fall) let alone any of the mountain species like Cassin's Finch that often visit. So I was delighted today to find a male and several female Cassin's Finch including the one in this pic in the Royal Gorge Park just west of town.